The ISO Microchip that my vet puts in for me is not a tracking device. It is a chip (size of a piece of rice) with ID numbers on it. When scanned the scanner communicates to a data base, which gives your contact information to the vet or shelter. States and used by many large veterinary groups and an increasing number of municipalities across the country. ISO microchips comply with ISO standard 11784 and are the standard in many countries across Europe, Canada and Japan and comply with ISO standard 11784. 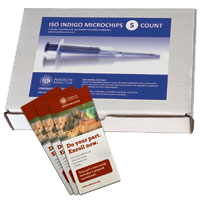 ISO microchips are recommended if you will be traveling outside of the United States with your pet.